Lovebirds are friendly, affectionate, playful birds that can make good pets. 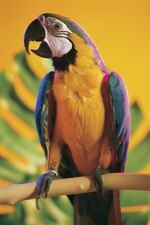 They have a lot of personality in their small, colorful bodies and can brighten up your home with both their plumage and their spirits. It is important to know the gender of your birds so that you can plan for or prevent their mating. Also, female lovebirds are more aggressive than males, so knowing your birds' genders can help prevent behavior problems. Observe how the birds sit. Female lovebirds will tend to sit on perches with their legs farther apart than male lovebirds. Compare birds' coloring. Male lovebirds, like many other species of bird, will tend to have more brightly-colored feathers than female lovebirds. Compare how the birds flare their feathers. When birds meet each other, they will often flare their tail feathers to show off their own gender and establish hierarchy. When females flare their feathers, the feathers will tend to be straight across and of approximately the same length. Male lovebirds' tail feathers will tend to be shorter at the edges of the tail, causing the tail to appear slightly rounded. Watch to see if one bird feeds another. Male lovebirds will tend to feed female lovebirds, especially if the female is nesting. Hold the lovebird on its back in one hand. Place its head between your index and middle fingers and hold down its wings with your thumb and pinky. This will keep the bird secure and prevent it from wriggling or flapping away. Place the free hands' pinky finger between the bird's legs and feel along the bird's tail until you can feel two points of bone. Push gently on the bones. If they feel very close together, the bird is male. However, if there is room between the bones and it feels like a finger could slip through them, the bird is female.